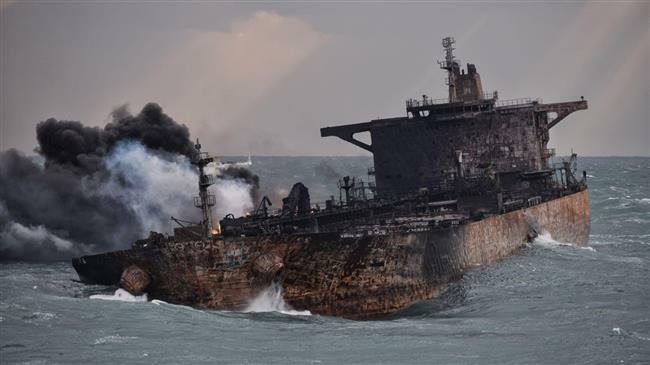 The Iranian oil tanker Sanchi, owned by the National Iranian Tanker Co., was destroyed in an explosion and fire after it collided with the grain carrier CF Crystal off the coast of China on January 6, 2018. All 32 members of the ship’s crew were killed. The Sanchi was carrying nearly a million barrels of condensate, an ultra-light crude oil, from Iran to Hanwha Total, a South Korean petrochemical company. The Crystal, laden with grain from Kalama, Washington, and heading to the Guangdong Province, China, with 64,000 tons of grain. This vessel, having sustained extensive damage to the bow, was successfully brought into port at Zhoushan and its crew of 21 survived the crash. Observers said it appeared that the 738-foot-long Crystal collided with the side of the tanker, then scrapped along its hull ripping tanks and igniting oil and oil fumes with showers of sparks. The big 900-foot tanker was all ablaze, burning for eight days before it sank in a volley of explosions. The wreck now lies in over 370 feet of water in the South China Sea. It may still be leaking after already creating one of the largest oil spills in history. The two ships collided in stormy weather which hampered rescue efforts. A large burning slick of crude oil also hampered efforts to rescue crew members and battle the flames. The accident occurred about 160 miles off the coast of China and the mouth of the Yangtze River Delta, Chinese authorities said. The tanker was built by the Hyundai Samho Heavy Industries, Yeongam, South Korea in 2008. It was launched as the Saman but then was renamed Sepid after delivery. Then in 2012 this sip was renamed Gardenia, then before the year was over, given the name Seahorse. It was flagged to Tanzania in 2013 and given its final name, Sanchi. The ship was operating under the Panamanian registry at the time of the disaster. Cause of the collision was allegedly still under investigation at the time of this writing.